The slopeside Private Residences at One Steamboat Place are located adjacent to the Gondola in Steamboat's Mountain Village. With four bedrooms, Guadalupe Mountain is a beautiful residence offering delightful lodging within this world-class resort and spa. This four bedroom residence, overlooking the mountain village plaza, Guadalupe Mountain is a beautiful home in the heart of Steamboat mountain village. Its distinctive location in the Center Wing allows direct elevator access to the ski valet and gondola square with coffee shops, restaurants and stores. It features a large private deck with great views to enjoy with your morning tea or a cocktail in the afternoon. The iconic OSP kitchen design is complimented by professional equipment like Viking and Sub Zero appliances. You can grill outside year-round on the built-in Viking gas grill on the deck. OSP residences are designed for entertaining. This residence is no exception with seating for 10 at the dining table and room for more at the kitchen island. This residence features a large living area, and its open floor plan connects the living and dining areas to the kitchen with plenty of room for the entire group to gather. State of the art a/v equipment provides high-definition entertainment after a full day of activity. 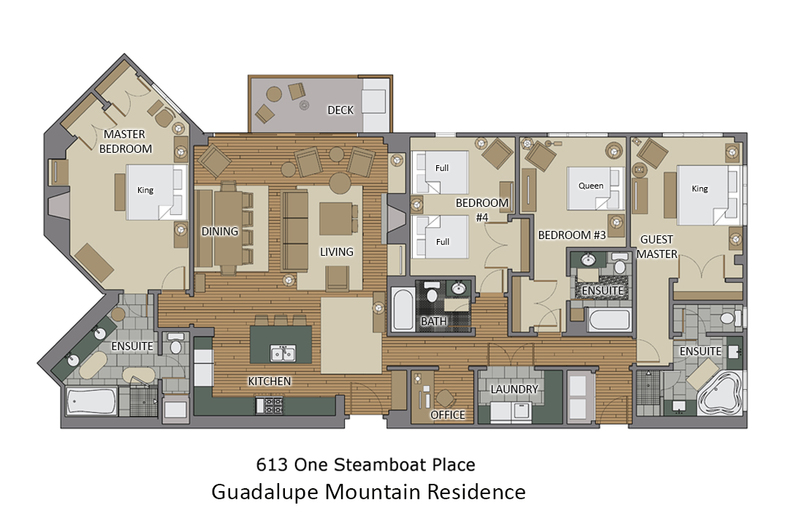 Guadalupe Mountain offers a Master Bedroom with King bed, gas fireplace and an oversized ensuite bathroom with steam shower, double sink vanity, rain showerhead, and Jacuzzi tub. The Guest Master also offers a King bed, the third bedroom offers a Queen bed and the fourth offers two Full beds, all with full private bathrooms. Awesome place to stay. Cant wait to go back! Not one negative thing to day! Condo is beautiful and spacious and close to everything you could possibly need! Plus the staff is unbeatable! This was our second time in this unit! Top Notch First class place !! We had 8 adults this time and were very comfortable . The staff is also great at assisting with activities and transportation! We will be back for sure!